This is the time of year that I am at my most vulnerable for self-delusion. I used to do it with gardening catalogs but now that my knees are shot and I have far less patience than I used to have, I confine my gardening activities to hoping that a blossom will be tall enough to show above the weed tops. The sun always shines in my kitchen no matter what time it is. No now I delude myself into thinking that I am the perfect housewife. Icy winter can rage outside, but inside my domicile is warm and cozy thanks to my housewifley efforts. 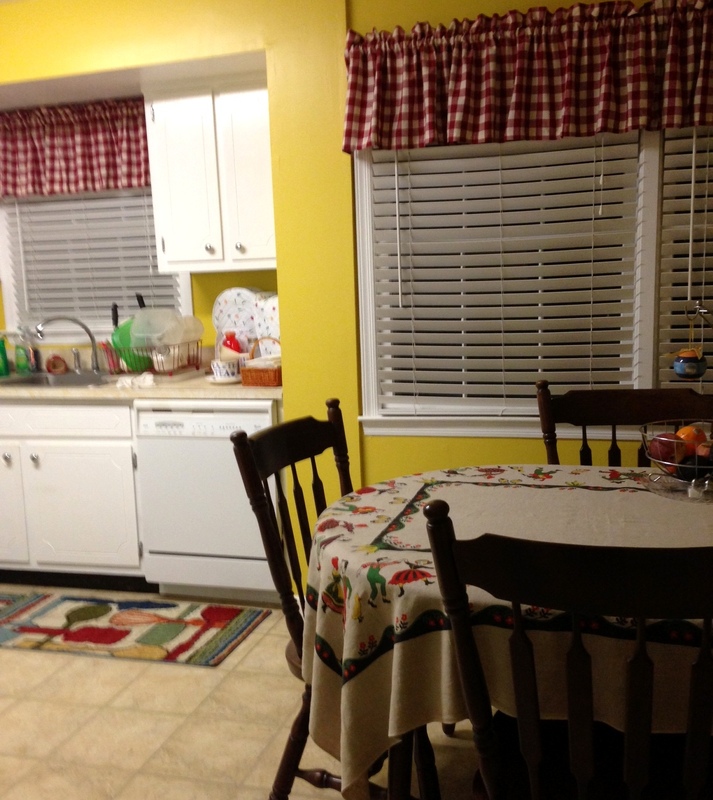 To this end, I’ve set out a wild riot of curtains, tablecloth and area rugs in the kitchen to liven things up. Everything looked so blah and sterile after the Christmas things came down but now my spirit is cheered for the whole 5 minutes that it takes me to bread. That is my attention span these days. FYI – I am becoming positively expert in cloaking and slashing. I enjoy the slashing. Probably too much. It’s not only bread that keeps me busy but also beverages. Thinking about beverages and planning for beverages. In the evening I can’t wait to go to bed so that I can get up early and start the coffee pot. I’m working mostly from home these days so when the clock starts heading to 4 or so, I plan on what it will be like to go downstairs and sit in my big velvet chair to have a cocktail while I watch pop culture trash* I have DVR’d. I don’t always have a cocktail and sometimes I pour the first cup of coffee and let it sit until it gets cold. So it’s not so much the beverages themselves as it is the anticipation of beverages. Anyway, it’s all about the illusion/delusion of being safe and cozy in a storybook house. So really just a lot of free time and nothing much to do. *** I probably wouldn’t have gotten so wrapped up in this if the new season of American Gypsies had started. That one is my true trash TV love. I’ve been spending a lot of time with snack crackers lately. I haven’t had a good cracker all month. In fact, I can’t remember the last time I had a good cracker. I used to be all about rice crackers but lately I find them to have very salty surfaces. what used to give a lovely snap of the Stone Ground Wheat Thin now seems soggy and sandy at the same time. Furthermore, I cannot abide a buttery cracker. Town House Crackers? Ugh. Butter flavored pretzels? No thanks. Except Ritz. Ritz is/are its own category. Buttery though it may be, I can still enjoy a Ritz if someone puts it in front of me. I don’t go out of my way to seek one out though. Triscuits are the queen of crackers but now there are so many varieties when really there was only need for the original. Do you know how much time I’ve spent ducking Olive Oil and Dill Triscuits? It’s a full time job. Chex Mix? No. The Chex Mix people don’t include the highly prized Cheese Tidbits anymore. Fie on Nabisco who discontinued the perfectly lovely Cheese Tidbits. In 2002, yet. Now the only option is the second best (far second) Cheese Nips which do not even get me started. Or the loathsome Cheese-its .Good God Almighty. And those six packs of peanut butter crackers. Can we all agree that they only taste good if they drop out of a vending machine? Goldfish? um … NO. I could go for an Oysterette right about now. But I could always go for an Oysterette. I like a plain cracker, like a Table Water biscuit. Or something with visible pepper particles in it. I like to test my mettle against a hearty Scandinavian Wasabröd but leave me alone if you come bearing those hippie seaweed crackers. Really, me and crackers lately – we’re likethis. And it’s rarely a good thing. Bread, though. Bread. 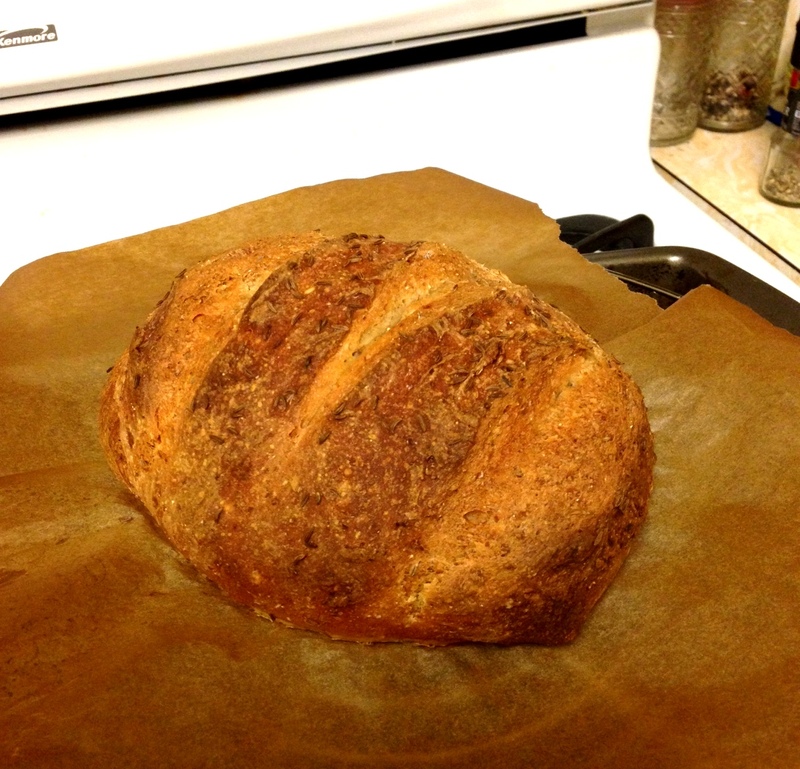 Remember my previous somewhat stealth references to moderate sucess with 5 Minute Bread? Well, I’ve got the cookbook now instead of depending solely on the hipster Jezebel re-interpretation of the technique and man, does it make a world of difference. 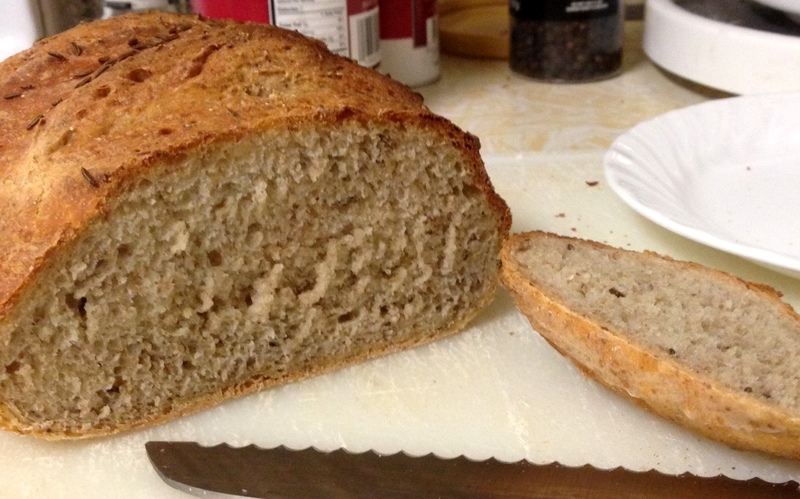 Darlings, it’s le petite boule of deli style rye. This one is perfect. So perfect that the Complainer-In-Chief will have to give up carping about how much room my 6 Qt. 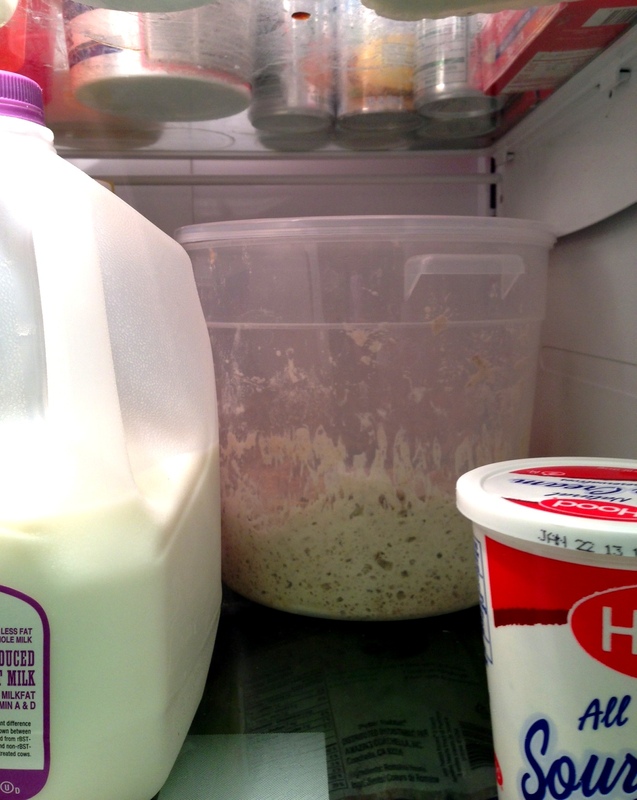 Dough Bucket takes up on the tall shelf of the refrigerator. And should we talk about my crumb? They say that whatever you are doing on New Year’s Eve, you’ll do through out the New year. If that is the case, I think we can all look forward to some steady lovin’ from the oven in 2013. Ok I admit the crumb could use a little more work. You don’t know what this means to me. 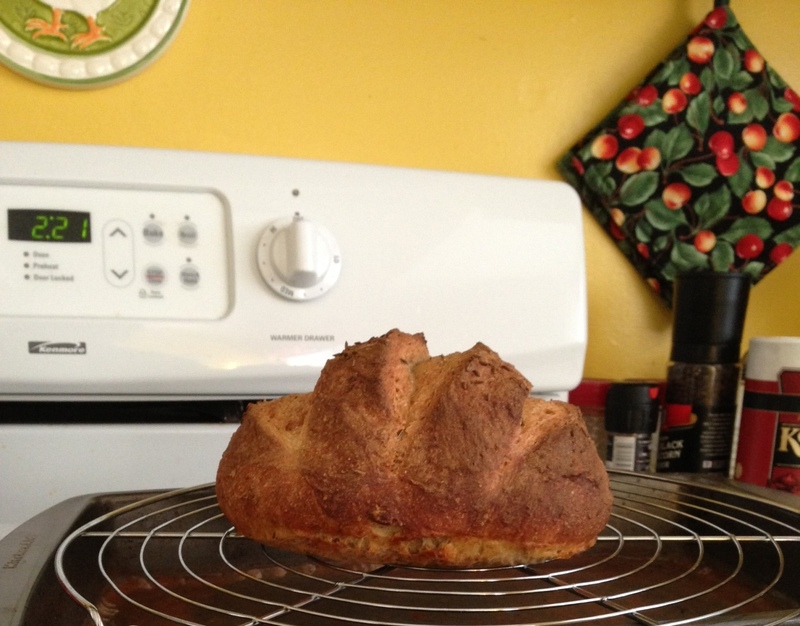 I never had what it takes for anything involving yeast but now! Tomorrow: we’ll use the same refrigerated dough to make Onion Rye and the day after, Black Olive Rye. then a Yankee Cheddar Loaf or something containing thyme and rosemary. Things are going to be good around here, despite the oppressive yolk of government debt and choking recession We’ll have warm bread and pride in our accomplishments and family and love and as much good health as we can still grasp and hold close. 2013, I rise to meet you.